Is it allowed to be addicted to chickpeas? Like being addicted to chocolate? I think I am. Addicted to chickpeas, that is. I panic when my dried chickpeas are finished when I had plans to use them for dinner. Low level panic, but still. What I like about chickpeas (apart from their health benefits) is that you can make them at home faster than most other pulses (apart from lentils perhaps). They don't need to soak in water for as many hours as other dried beans. Once they have soaked for a couple of hours, they cook quite quickly. So if you decide by mid-afternoon to have a chickpea dinner, there is still plenty of time. You surely won't be needing those far too soft canned chickpeas. Once you make a big pot of homemade chickpeas, they keep well in the fridge for a week or so and can be used in forthcoming dinners, salads, etc. If you have cooked chickpeas at home, this prawn stew is put together in no time and can easily be done on a weekday night. It will be a true journey for you taste buds: The stew is given some depth with bacon, some spiciness with chili paste. 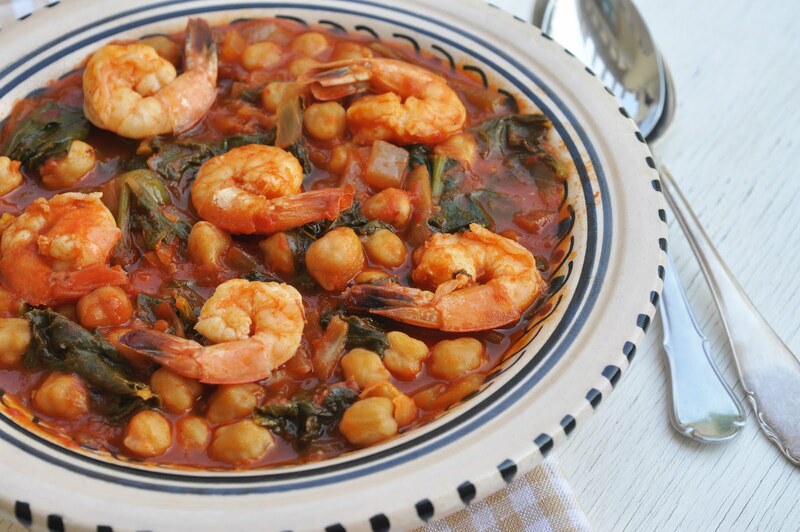 The prawns will still preserve their texture and light flavor, supported by earthy chickpeas and green leafy spinach. An all-in-one pot of goodness and tastiness! Place the bacon in a large heavy-bottomed pot over medium heat. When the bacon starts releasing the fat, add chopped onion and minced garlic. Stir regularly and cook until onions have softened, about 5 minutes. Stir in chili paste and cook for another 1-2 minutes. Now add chopped tomatoes, vegetable stock and chickpeas. Bring to boil, then cover pot with lid and turn the heat to medium low. Let simmer until sauce has thickened, about 8-10 minutes. Now gently place prawns on top, cover again and cook until prawns are just done, about 5 minutes. Gently stir in spinach and cook until wilted, 1-2 minutes. Season with salt and pepper. Serve with bread or over rice.